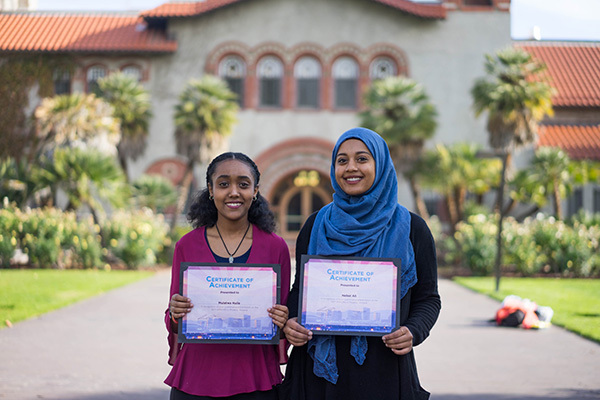 Mulatwa Haile and Nebat Ali have several years of research experience between them—and recently received an award for presentations of their work at a national conference—though they are both still in their junior year as undergraduates at San Jose State University. The students applied to be part of programs on campus that aim to give research opportunities to undergraduate, underrepresented, students in the fields of science, technology, engineering and math (STEM). Haile, a biological sciences student with a concentration in systems physiology who is minoring in chemistry and also hopes to complete an African American Studies minor, applied for the Research Initiative for Scientific Enhancement (RISE) program. Ali, a biological sciences student with a concentration in microbiology, started out with the Louis Stokes Alliance for Minority Participation (LSAMP) and worked wi Dr. Miri VanHoven. She noted that as an undergraduate it is challenging to balance working in a lab where she can learn techniques and make connections that will benefit her in the future while also finding the time to study. One of the most valuable lessons she learned is time management and trouble shooting. The students are now involved in Maximizing Access to Research Careers Undergraduate Training in Academic Research (MARC U-STAR) program. Ali agreed that the research experience has helped her in many aspects of her educational career, including applying concepts from class to the experiments with which she is involved. Last fall, they traveled to the Annual Biomedical Research Conference for Minority Students (ABRCMS) in Phoenix, Arizona, where they connected with more than 2,000 like-minded students to present research findings. The SJSU cohort included 25 students who presented 16 posters and conducted two talks, with the support of faculty members Dr. Karen Singmaster, Dr. Alberto Rascon, Dr. Cleber Ouverney and Wilkinson. Haile presented her research on the effects of obesity on spinal cord excitability and Ali presented work on how nematodes evolved to avoid Streptomyces bacteria. The two were among the select students from across the nation to receive awards for their presentations. Ali noted that historically white males have dominated the field of science. In addition to RISE, LSAMP and MARC, the university has other programs that support research opportunities for undergraduate students who are underrepresented in STEM fields. These include the McNair Scholars Program, Research by Undergraduates Using Molecular Biology Applications (RUMBA) and S-STEM. The programs are funded through a variety of federal grants and many students who have participated have gone on to complete doctoral programs. 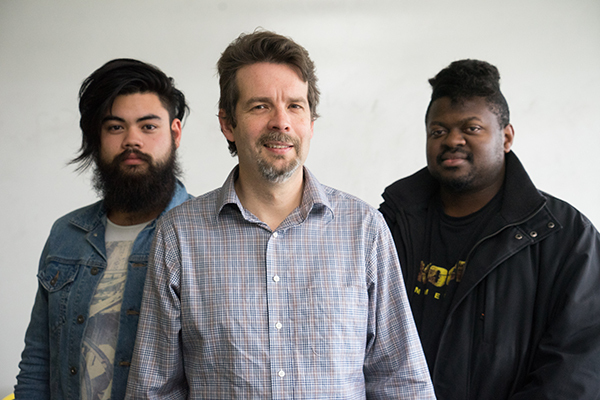 “The two awards confirm that the research taking place on our campus is meaningful and that our students are as competitive as those at top research institutions in the nation,” Ouverney said. 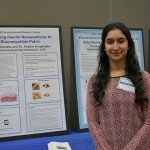 Ashleen Sandhu, an undergraduate student in the Charles W. Davidson College of Engineering’s biomedical, chemical and materials engineering department, presented a research poster at the annual Celebration of Research on Feb. 10. 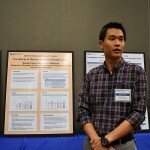 Morgan Change explains his research project to a faculty member at the Celebration of Research on Feb. 10. Madiha Shah is one of dozens of students who presented her undergraduate research at the Celebration of Research on Feb. 10. 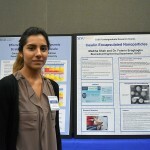 Madiha Shah and Ashleen Sandhu, ’16, Biomedical, Chemical and Materials Engineering, both became interested in creating a new way to deliver insulin for diabetic patients because of a family connection to the disease. Sandhu said her mother was diagnosed with gestational diabetes during a pregnancy. “It was really hard because some people don’t like needles,” Sandhu said, noting that her father helped by administering insulin injections to her needle-averse mother. Shah’s mother also has diabetes and she said her work at a pharmacy puts her in contact with patients who have the disease. Through SJSU’s Center for Faculty Development Undergraduate Research Pairs program, they received a grant to support research on developing a noninvasive patch to provide a daily insulin dosage for pediatric patients. Dr. Folarin Erogbogbo is serving as their faculty mentor. “He’s there to give us technical feedback and to help us network with the right people,” said Shah, who plans to study pharmacology after she graduates from SJSU this spring. Sandhu wants to find employment in a research lab after graduation. Morgan Chang, a computer science student, partnered with Dr. Katherine Wilkinson, from biological sciences, as part of the Undergraduate Research Pairs program. They studied the impact of a high-fat diet on glucose levels in mice. This year, 34 students received grants to work with 20 faculty mentors, including students from the College of Applied Sciences and Arts, the Lucas College and Graduate School of Business, the Charles W. Davidson College of Engineering, the College of Science and the College of Social Sciences.